It goes without saying that if you have the best miter saw, you need the best stand to achieve the greatest results. It is imperative you purchase a miter saw stand that fits your budget and needs. Buying the right tool is a better investment decision than making your own stand which might compromise stability and precision. 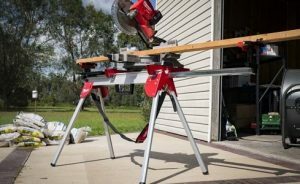 What should you check when shopping for the best miter saw stand in 2019? No doubt, finding the perfect accessory can be a pain in the neck but you shouldn’t worry because this article has everything you need for a smooth shopping experience. We have done the hardest part for you and researched the list of the top 10 miter saw stands that are trending this year. Whether you need a collapsible miter saw stand or a universal miter saw stand, this is your comprehensive review and buying guide. 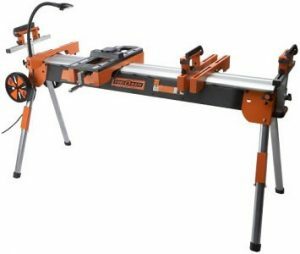 What To Look For In A Miter Saw Stand? Before we provide a list of the best saw stand brands in the market, we would like you to learn the 4 major varieties at your disposal. A traditional stand is a basic workbench and the simplest design you’ll find on the market. It consists of two wooden sawhorses with a plank across them. The design is quite heavy hence it’s considered outdated because it requires you to work in fixed place. It might not be suitable for a commercial woodworker who needs to move from one job site to the next. However, it could be your best bet if you work with a heavy duty miter saw as it accommodates an incredible amount of weight. Rail miter stands come with 4 metallic legs which protrude from a horizontal rail, hence their name. The legs can be pulled back and forth. The stands also feature clamped crossbars which are placed at any spot on the rail, allowing for versatility. This is the type of stand you need if you own a variety of miter saws. It can work with a folding miter saw, best rolling miter saw, or sliding miter saw. Moreover, it provides a convenient extension that allows extra working space. The design of a tabletop stand is just as you would imagine – a flat surface where you can mount your saw. 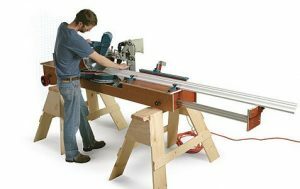 Like the rail miter stand, a tabletop stand enables you to use a wide array of saws. The only difference is a tabletop requires your saw to be bolted to the top hence there’s limited mobility of the stand and the saw. This is the best portable miter saw stand and comes with everything you need. Not only is the table portion constructed in a sturdy material but there are also two legs that set widely apart in addition to a pair of wheels. The best feature is the single-handed design. You simply make a quick release of the catch to fold the table upright. To unfold the stand, release the catch again and it will unfold. It is no wonder it’s a favorite stand among most miter saw users. These stands come in different designs and styles. They are constructed in metal with a plank and dual horse legs. A compound miter saw with stand offers a great balance between sturdiness and portability. Some parts may look traditional but most features are upgraded, thereby giving you the right balance. You can also refer to a miter saw as a drop saw. It is a fundamental power tool that is used in almost any carpentry work to make fast and precise cuts at specific angles in a workpiece. It is mostly used to cut trims and moulding. Most miter saws, with the exception of the traditional models, are compact and portable. Their blades range in size from 8” – 12”. With the best miter, you can accomplish the following tasks. To use a miter saw, you need to have the following tools and materials. First mark your board and grip the material firmly with a steady hand. Line up your blade to align the cut and use your thumb to lift the blade guard, sighting down one side of the blade. This is where you should be very careful not to cut your fingers (keep them at least 6” from the danger zone/blade path). Make sure that the material is clamped firmly before releasing the blade guard. Then, take your hand back to the switch and cut the board. If this is your first time, the experience might be a little startling. The miter saw may kick when you first start the blade. Before making a cut, it is best to wait until the blade reaches the peak speed. When lowering the blade, do so slowly but steadily through the material to ensure a completely clean cut. Hold the carriage firmly and release the switch. Don’t raise it or reach under until it stops spinning. Need a perfect wood miter saw stand? Take a close look at the 10 top-rated miter saw stands plus their reviews so you can get a clear idea of the most suitable option for your needs. If you are a fan of DeWalt, we have some of the most exclusive models. Hopefully, this information will make your buying process easier and quicker. The DeWalt miter saw stand is a great tool with a universal design. But it doesn’t have wheels so it’s not easy to move your saw from one point to the other. However, it is very sturdy as you would expect from aluminum truction. If you have a carpentry project that doesn’t require you to move your miter around, then the Dewalt DWX 724 would be an ideal solution. Don’t worry about transportation and storage because it can easily be folded at your convenience. Luckily, the sturdy legs provide a strong base for any material and saw. Here is a wheeled miter saw stand that facilitates easy mobility on a job site. The DeWalt DWX726 heavy-duty rolling miter saw stand comes with adjustable mounting brackets, giving you the flexibility of mounting any miter saw in the shortest time possible. The DeWalt DWX726 miter saw stand is bulkier than the sister model- DeWalt DWX724 but it shouldn’t worry you in terms of mobility because the wheels make up for that. We can confidently say that is it the best mobile miter saw stand. Does your job involve high capacity cutting? The DeWalt 12 sliding compound miter saw with stand must have been designed for someone like you. 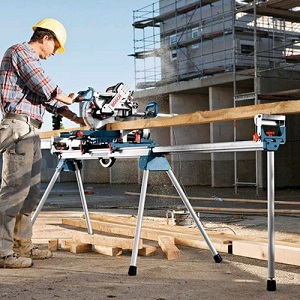 This product is a combination of a miter saw and stand (DWX726 Rolling Stand). Take a look at the features of the two items. DeWalt 12 compound miter saw with stand is a reliable power tool you should have in your garage whether you are an amateur or professional carpenter. The multiple features of the 12 miter saw with stand makes it easy and safe to use. While the saw is not very hot on small pieces of wood, it ensures precision when cutting large pieces. Kobalt miter saw stand is a compact miter saw stand that supports a maximum weight of 400 pounds. For easy mobility at your workstation, it comes with heavy-duty 8” wheels. Here is a complete list of the features. There are many stands on the market but the Kobalt folding miter saw stand is one of the best budget buys. However, we recommend if you have to store it with the saw attached, make sure it is secured to a post or wall. Milwaukee miter stand is an aluminum saw stand that works with all major saw brands. It is a perfect option if you are seeking a folding miter stand design. Do you want to save valuable storage space in your garage? The Milwaukee miter saw stand should be on your bucket list. It is one of the miter stands we highly recommend when it comes to weight support. It suits any user and situation. The Ridgid miter saw stand has numerous plusses, making it a great option for woodworking. Check out the distinctive features. Ridgid MS UV miter stand can be used with all compound saws since it has a universal quick release mounting system plus a secondary lock that secures the ensemble. Overall, Ridgid miter saw stand with wheels is the best portable miter saw in terms of functionality, design, and value. The durable truction of the Ryobi miter saw with stand makes this tool a great buy for your money. If you ever need a good balance between heavy-duty and portability, choose the Ryobi miter saw stand today. You won’t be able to move it around the job site but the easy fold-up design will make transportation and storage easier. Is your miter saw too bulky to move around your workstation? You don’t have to change it. All you need is a universal stand with wheels to carry it wherever you like. The Trojan miter saw stand could be your answer. Find out why. Trojan ms-2000 miter saw stand has everything you need for your portable miter or folding miter. We recommend it particularly for professional handymen who require moving from one job site to the other and have to carry a stand with them. However, you must drill and mount your saw manually since it is not pre-drilled. There are a lot of cheap miter saw stand on the market today but none of them can carry as much weight as the Wen miter saw stand. It can take on materials up to 10ft and 750 pounds. This tells you that it is the best stand for heavy-duty saws. Remember that the rollers of this miter stand work as stops so you can make istent cuts. The universal design is not only suitable for the WEN miter saw series, but also makes a great stand for other popular miter saw brands. There you have the best 9 saw stands to choose from. Be sure to consider the various features and determine what is more important to you. As you research, we also recommend you check the Black and Decker miter saw stand which is another impressive miter stand. Also, don’t forget to check the reviews and see what users say about these products. 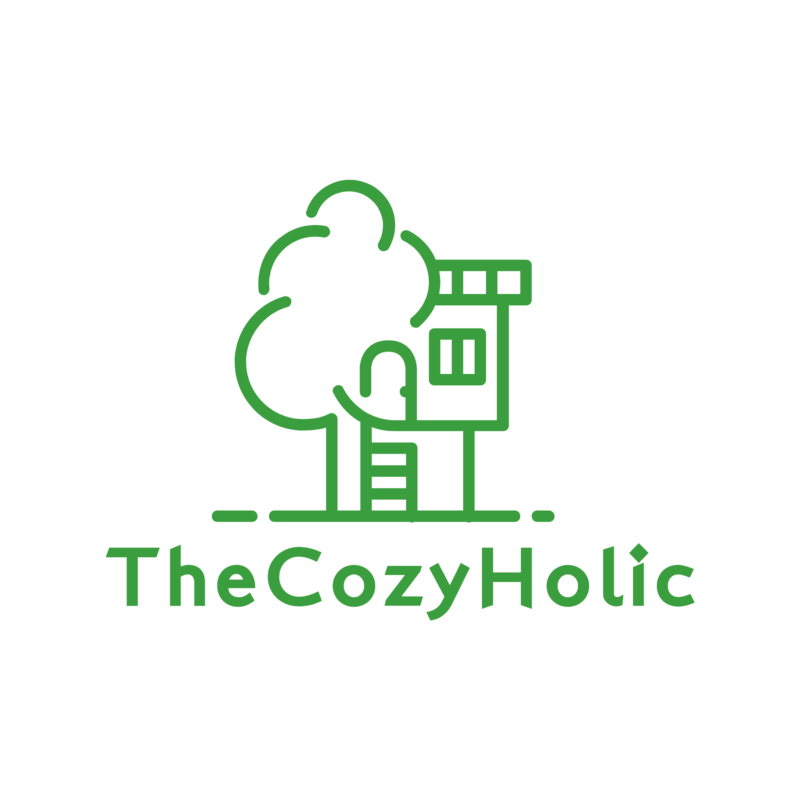 According to TheCozyHolic, the ideal miter saw stand endures the test of time and that is why we assist you to get it right the first time. We strongly believe the DEWALT DWX726 Stand has everything you need for woodworking so we pick it as our number 1. However, for ultimate mobility, we encourage you to check the Ridgid miter stand. Enjoy a great miter saw stand shopping experience!